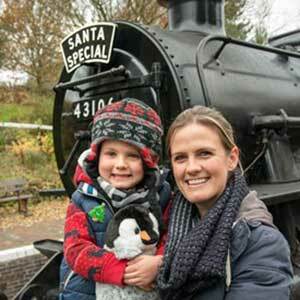 Travel from Cheltenham Racecourse Station by steam train all the way to Winchcombe (or the North Pole!) through the long tunnel, and visit Santa and his elves in his grotto. When you arrive at Winchcombe the elves will meet you off the train, and make sure you have plenty of time to visit Santa and receive excellent presents especially selected by him for each age group before your train returns to Cheltenham. Travel by steam train in a vintage carriage from Kidderminster to Arley where you get off the train and the children, and the grown-ups, will have the thrill of meeting Father Christmas in his grotto where all fare-paying children will receieve a gift. The historical Stations are dressed for the occasion, with plenty of photo opportunities both on and off the train. Visit the Dean Forest Railway this Christmas for your chance to ride behind a real steam engine with Santa and his helpers on board – no queues for a grotto here!! Each child will receive an age related gift and each adult will receive a mince pie and a miniature to help keep warm! The cafe will be offering seasonal refreshments all day, and the shop is well stocked with toys and gifts for both young and old. Take a seasonal excursion by diesel and steam train to Chester and see this famous city decked out in its finery for the festive period. Its historic shopping area will be a haven of colour and lights, complimented by the many wooden chalets around the Town Hall Square and Cathedral offering exclusive gifts and produce.